If you’ve been umm-ing and ahh-ing over the influx of ‘beauty boxes’ to the market, I’m just about to make your life a little more complicated. Latest in Beauty were the beauty box scene pioneers. Back in 2008, I agonised over choosing my first three samples, paid my £1 (taken off my mobile phone bill) and waited with bated breath for my beauty box to pop through the letter box. A few days later, it did and has over the years introduced me to some great brands like Ginvera, Blinc and Lavera, not to mention cultivating my addiction to Elemis. The company went through what I’d describe as a ‘wilderness’ period a couple of years ago (a 1ml sachet of sun protection – what’s that gonna protect, my little finger?) but relaunched with a new website, adding more strings to their bow ever since. 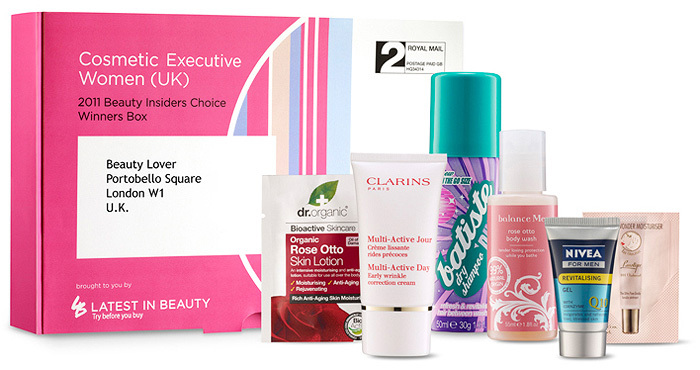 Most recently, they’ve introduced the Beauty Insiders Choice Winners Box, where for £4.95 – you will receive 6 products worth in the region of £20 that share the common theme of picking up a trophy at this year’s prestigious Cosmetic Executive Woman awards. Dr. Organic Rose Otto Skin Lotion (5ml sachet), Clarins Multi-Active Day Early-Wrinkle Correction Cream (15ml tube), Batiste Dry Shampoo (50ml can), Balance Me Rose Otto Body Wash (55ml Bottle), Nivea for Men Q10 Revitalising Gel (15ml tube) and Lanolips 101 Lip Ointment (1g Sachet). The Clarins is clearly the shining star of the set when it comes to value, 50ml of product usually retails at £38, making a 15ml tube more than cover the outlay for the £4.95 box. The transparency is refreshing for people who like to know exactly what their money will be buying them, I’m a bit torn – I lurve nothing more than a wonderful surprise but I am also a horrific control freak. Just ask Mr. L.
This is the first of the new themed boxes produced by Latest in Beauty, so if this one doesn’t grab at your wallet, be sure to check back soon for more. 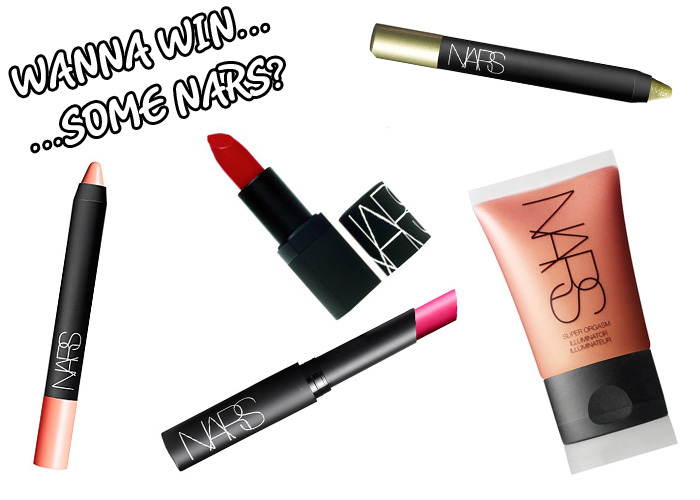 As a little sweetener to tempt you into trying, Latest in Beauty have put together a rather delicious prize in the shape of a NARS-A-PALOOZA! This lovely lot will go to ONE person who orders a CEW box from latestinbeauty.com using the exclusive code LIPGLOSSIPING before 30th September. Only one entry per person and DON’T FORGET THE CODE! Good Luck! What are your thoughts on the Latest in Beauty CEW Beauty Insiders Choice Winners Box? Wow! That’s a heap of products for not a lot of money. You UK girls are lucky! At least we’re finally starting to see some of these in Australia now. I use Latest in Beauty, I do like it lots but this month I have upgraded to Glossybox and Boudoir Prive, I am soooo excited! I’m always a bit wary about these boxes, there was one that did the rounds earlier this year where one of the products inside was tea. I wouldn’t really be too impressed if I’d been sent tea. But I think therein lies the problem, you can’t please all of the people all of the time and there’s always going to be someone who has a gripe with what is in the box. I think the one where they let you choose was better. I’ve bookmarked this page for when I get home!! I hope us peeps that have already ordered, received and started using their goodies are included in the sweepstake for those nice NARS goodies! Aww. oh well – at least virtual biscuits are calorie free too!